Expert Writing are a genuine service that offer a budget-friendly price and total privacy to their customers. However, there are issues with their customer service team and the quality of essays they put out. 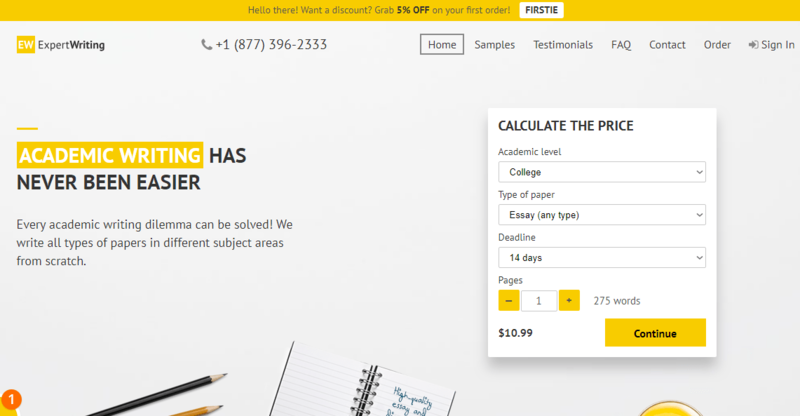 They do stack up against many of the average essay writing services that are out there. There are plenty of essay writing sites out there, so what makes ExpertWriting.org different? Are they worth ordering from? Read this review to find out everything you need to know. At the time of writing, there are just under 50 writers working with ExpertWriting, 12 of whom are from the UK. There are 22 writers with Masters degrees, and 9 with PhDs. This is a very small amount of writers to have on a team, and this leads us to believe that you could be waiting for a long time for a writer with expertise in your subject. If you’re in a hurry, this isn’t ideal. Is the writing quality from Expert Writing good enough to pay for? To find out, we looked at samples of their work as well as reviews from customers who have bought from them in the past. We saw that there were quite a few complaints about the style of writing they were getting. Essays were often missing proper citation styles, meaning their essays were at risk of being flagged as plagiarism by their universities. When you order an essay from a writing service, you expect that their writers can handle essay essentials like this. Prices will always vary depending on what you need. As an example, take a 2 page undergraduate essay that’s due in 14 days. With this service, this will cost you $21.98 USD. You can get a 5% discount on that price as a new customer. 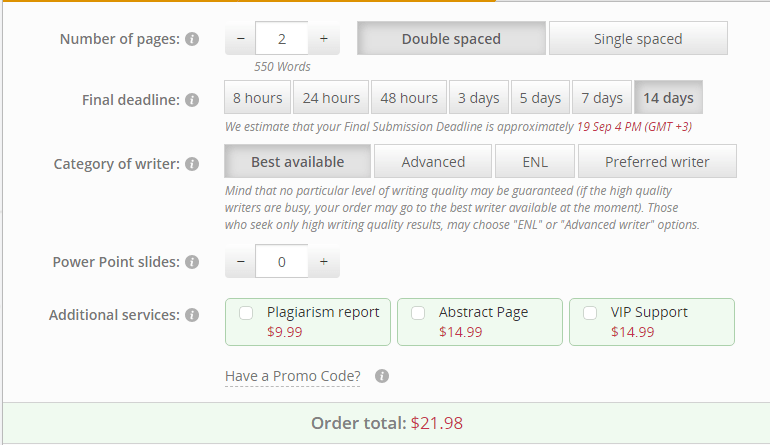 You’ll also be able to buy additional services, such as a plagiarism report for $9.99, an abstract page for $14.99, or VIP support for $14.99. There’s a customer service team ready to talk to you 24/7 if you need help with your essay. They’ll help with refunds, revisions, or just questions about the service. You need to be aware, though, that the team aren’t based in an English speaking country. You may wait a while for a response, and communication could be difficult. This isn’t great when you need to be able to get across what you need. expertwriting.org is the worst service ever, the essay they gave back to me was not even written in proper English, I had to rewrite the whole essay my self, wasted so much money and time on this, completely useless, don’t use and if they say they offer you a full refund that is a complete lie, you won’t get a single penny back. DO NOT USE.